Pennsylvania’s Marcellus shale once again broke records by producing more than 2 trillion cubic feet of natural gas during the second half of 2014. This brought year end production to 4 trillion cubic feet of natural gas, as noted by the Department of Environmental Protection. That’s a 30 percent increase over the year before! The most natural gas produced during 2014 came from Bradford, Washington, Susquehanna, Lycoming and Greene Counties. 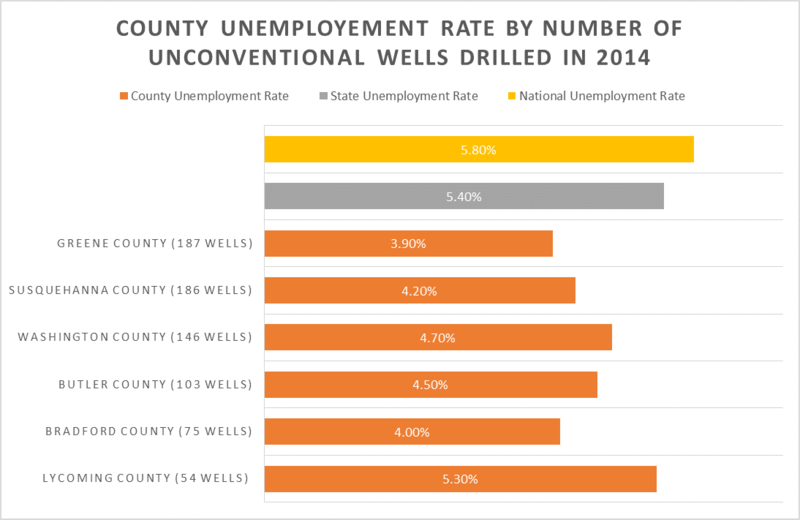 Not by coincidence, all of these counties also had unemployment rates lower than the state and national average during 2014. The Marcellus shale alone provided 16 percent of what the entire United States consumes on an annual basis. Even more amazing is that operators in the region are increasing production despite low commodity prices, thanks to increased drilling efficiencies. Shale development has helped cut imports to their lowest level in 20 years, supports well-paying American jobs here at home, and has supplied consumers with affordable and abundant energy. And the Marcellus continues to be a key player in the American energy renaissance.